How do you prevent your garden from being a 24-hour diner for every insect that passes through the neighborhood? There are several chemical products on the market that will kill insects, but many gardeners are hesitant to use strong chemicals on their plants. There are very effective organic insecticides and repellents available these days, and in a pinch you can make your own natural insect repellent. Most insects prefer a bland diet, so by making your garden spicy you can encourage insects to dine elsewhere. A hot pepper or garlic spray works great as a repellent and can actually prevent insects – and even hungry rabbits – from nibbling on your plants. 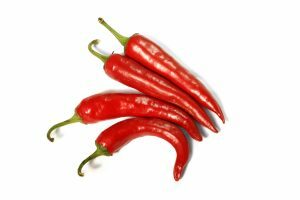 To make hot pepper spray, toss a couple of hot peppers, such as cayenne or habaneros, in a blender with about a cup of water. Puree the mixture, strain out any solids, and then add enough water to make a gallon of concentrated hot pepper juice. To use the hot pepper spray, mix a quarter cup of the concentrate with a gallon of water and a tablespoon or two of liquid soap. The soap will help the spray stick to the plants. 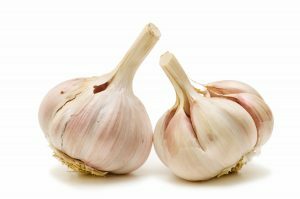 To make a garlic spray, roughly chop one or two garlic bulbs, place them in a quart jar and pour boiling water over the garlic, enough to fill the jar. Close the jar and let it sit overnight. Strain out the chunks of garlic and add the garlic water to your sprayer along with a few drops of liquid soap. Leftover garlic water can be kept frozen for later use. A good place to buy liquid soap for this purpose would be a health food store. Do not use a detergent or a heavily scented soap as these can be harmful to plants. Once you’ve made your insect repellent concoction, test it on a few leaves first before spraying your plants. The hot pepper and garlic smell will be strong when first applied but will fade, and your flowers and vegetables won’t take on their odor or taste. The spray should be reapplied every week or two, or after a rainfall. Mike McGroarty is the owner of McGroarty Enterprises and the author of several books. You can visit his website at FreePlants.com and read his blog at MikeBackYardNursery.com. Azadirachtin and Neem: What is the Difference?